Recipes are used for crafting and "smelting" (furnaces). To jump straight to sample code, click here (MBE35). 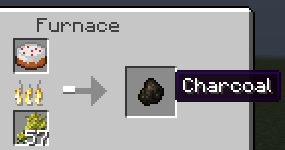 There are also "Ore" recipes, which are a Forge extension. "Ores" are a way for mods to add blocks & items which are equivalent to vanilla blocks for crafting. 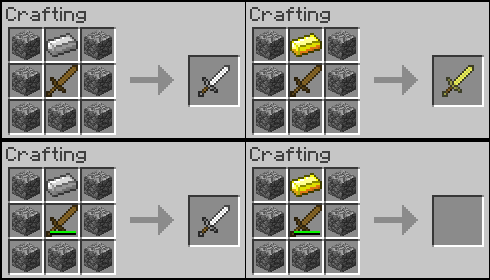 For example - an ore recipe which uses "logWood" will accept a log of spruce, oak, birch, pine, etc. If your mod registers its balsawood log using OreDictionary.registerOre("logWood", BalsaWood), then your BalsaWood log will also be accepted in the recipe. Vanilla recipes are automatically also valid when mirrored left-right. If you don't want this, you can use a shaped ore recipe with false as the first parameter. If you want the recipe to ignore an item's metadata / damage value, use OreDictionary.WILDCARD_VALUE for the damage value. The steel sword recipe uses OreDictionary.WILDCARD_VALUE to ignore the sword's damage. In contrast, the gold sword recipe only works on undamaged swords.